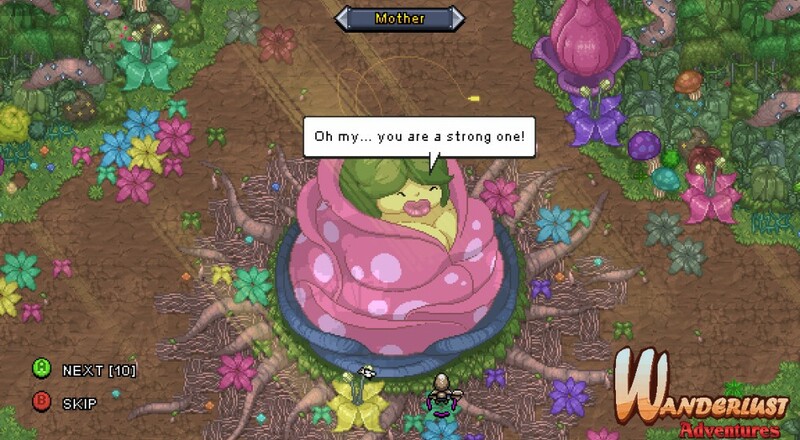 Wanderlust Adventures is a free-roaming open world action adventure RPG that's built around nostalgia and cooperative gameplay. It looks like a SNES-era role playing game, but with online co-op and huge environments to explore, gameplay is nice and modern. Dynamic events help sculpt the story you experience each time you play, and everything from map layouts to loot drops to mini-boss encounters is randomized to further boost replayability. The difficulty even scales depending on how many people you have playing, so no worries if you can't get your online co-op buddies to sit down for a weekly jaunt. Wanderlust Adventures is crammed with a lot of features that make you go "whoa, neat". And here are a few of them! Companions : Nearly every enemy can be collected, hired and leveled up! Anyone who also owns Wanderlust: Rebirth on Steam will unlock the original 8 heroes (to choose from) during character creation! Wanderlust Adventures is out now and ready to keep you entertained. We took a tour through the game back when it was in alpha, in case you're on the fence. Otherwise, pick Wanderlust Adventures up on the official website or grab it via Steam. Page created in 2.4578 seconds.